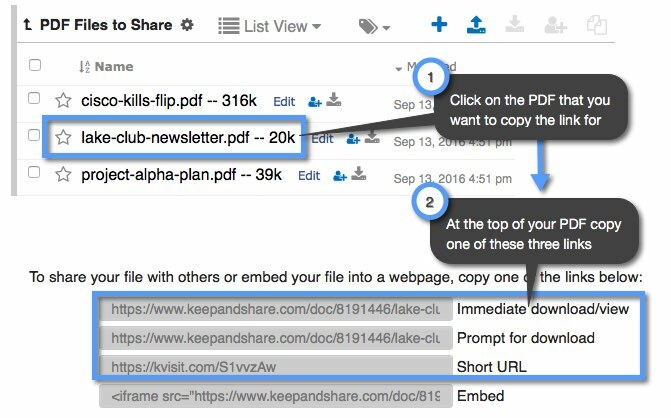 You can only upload PDF documents into Keep&Share, not create them from scratch. However, even if you upload a PDF into your account it will still receive a unique URL so that you can share your PDF documents with others. Immediate download/view: if the File is a PDF it will immediately open in a new browser tab for viewing (if the user’s browser is configured for PDF viewing). All other files download immediately. Prompt for download: The user is prompted to confirm the file download/viewing. Short URL: a very short URL for use in Twitter and other situations where you want the shortest possible URL. If the immediate view link does not open a PDF file, it is likely the reason is the browser being used is not configured for viewing PDF files immediately. Most browsers require a PDF viewing “plug in.” We recommend testing in Google Chrome because it builds in terrific PDF viewing capability. There is no plug in required. In our experience, Chrome always displays the “immediate” link in the browser. For other browsers, make sure you have an up-to-date PDF viewing plug in, and make sure it is configured so it will display PDF files in the browser.